Universal Audio has done it again! 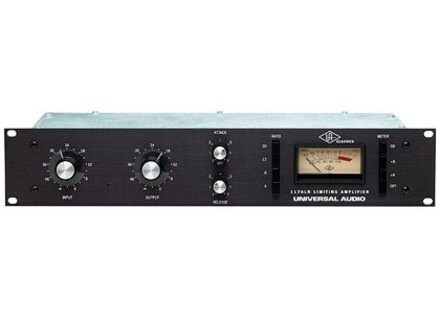 1176LN, Studio compressor from Universal Audio in the 1176 series. The 1176LN is a limiting Class A amp with F.E.T. gain reduction and huge sound! This rack is punchy, clean and loud; it sounds great with some guitars and even bass. You can get some really good sounds using this unit and it will require no effort at all. Our group has been using this rack for about 3 years now and it has worked great for us every time. It has a very classic look to it but still a very modern design and fits/looks perfect in our rig/rack. Adjusting the release time with the 1176LN can be -50 milliseconds to 1.1 seconds and there are compression ratios of 4:1 8:1, 20:1 and 12:1 that can all be changed or selected by pressing a button quickly and on the fly. There are no side chain inserts or outs on this unit. It will take up 2 rack spaces and the frequency response is 20 Hz to 20 kHz. There is not any threshold control on it but there are input, attack, output, release, ratio controls on it. Setting the 1176LN up is quick, after you rack it you will just need to plug up your audio/connections and that is it. There is only 1 XLR input and 1 XLR output on it. There are many situations and reason to use a leveling amp instead of using a compressor. So that was the reason we purchase it just for those times we would need a leveling amp. The sound we get with this unit is most definitely competing with major studios. I have even seen this exact same unit racked in a major studio that we went to before. The price is affordable and the quality is excellent. It is made well and coming from Universal Audio you can guarantee that it will be backed by great customer support and a warranty.